Or, in the particular case that’s overturned my emotional outhouse and toilet-papered my trees today — SEVEN. Seven Baha’is. Seven years in two different Tehran jails, and who can say which is more infamous? I might repeat to myself slowly and soothingly, a list of quotations beautiful from minds profound – if I can remember any of the damn things. 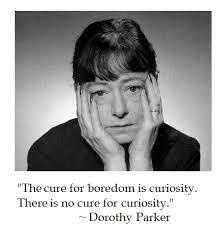 That was the divinely caustic Dorothy Parker, she also of “Brevity is the soul of lingerie” and a gazillion other nastily gorgeous things. I, too, have forgotten an absolute army of wise, witty sayings. However, setting up this Version 2.0 of JH.com, I had the opportunity (well, because of my rickety old Internet platform, the necessity) of looking at nearly 400 of my posts as I transferred them here. I also found a record of posted quotables. Hurray! And although I wasn’t terribly reliable about uploading quotations to my He Said, She Said box, there were quite a few goodies, so I’ve decided to repost them, too. You can take a look — they’re a LOT shorter than most of my posts! — just down and to the right. Good stuff.